Not only was Saturday, May 5, 2012, Cinco de Mayo and Kentucky Derby Day but it was also Tea Time at Grace. I had the privilege of sharing my enthusiasm and knowledge of tea with this lovely group by taking them on a journey into the miraculous world of "true tea," it's history, characteristics, and wellness proprerties. Tea Time at Grace was a delightful gathering of women from the Grace United Methodist Church in Hummelstown, Pennsylvania. 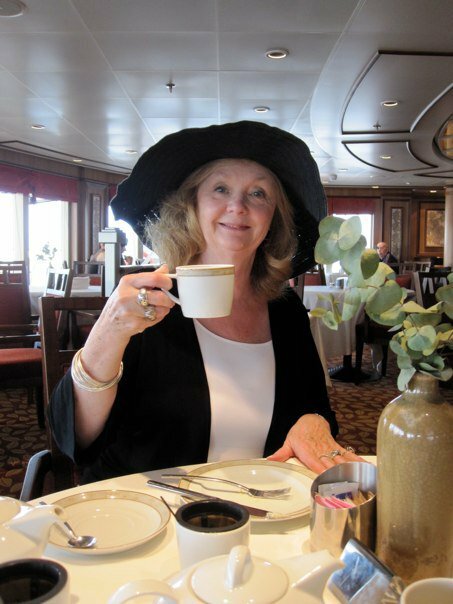 Three friends, Gay Wells, Nancy Williams, and Marjy Woodburn came up with the idea of the tea while enjoying tea on a recent vacation. They were so excited to share their enjoyment and friendship over a cup of tea with others who have played a role in their Christian lives. A year following this initial cup of tea the "tea time at Grace" became a reality. Our light tea menu consisted of finger sandwiches of egg salad, cucumber and cream cheese, and ham salad followed by scones with clotted cream and strawberry preserves. The tea desserts were yummy cream puffs and chocolate mousse cake. We took this opportunity to pair the tea sandwiches with a Chinese White Ginger Peach tea. The scones were accompanied with a Green Dragon Morning Tea. I selected a Burgundy Oolong to pair with the sweet chocolate desserts. All enjoyed the light afternoon tea menu paired with a tea which enhanced the flavor of the menu. I played the role of speaker but was treated as a friend in Tea. The ladies of the Grace United Methodist Church are gracious, friendly, and very welcoming. Should you ever have an opportunity to visit this Church please do so with an open mind and heart. You will have a very pleasant experience and come away feeling your life has been enriched. Thank you Nancy, Gay, and Marjy. Nov 15 Las Vegans Gather to Celebrate Tea!